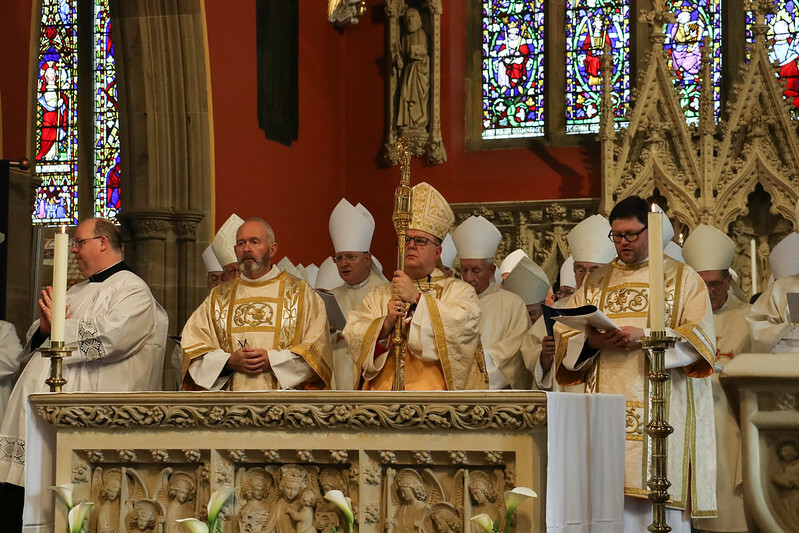 The celebration was attended by the family and friends of Bishop Robert and many clergy, including Cardinal Vincent Nicholls, His Excellency Edward Joseph Adams, Apostolic Nuncio to Great Britain, 36 Archbishops and Bishops, 209 clergy (priests and deacons) from our Diocese and other Dioceses and seven Seminarians. They were joined by the Diocesan Board of Trustees, the Curia, Religious, Vocations Enquirers, Ecumenical, Inter-faith and many civic dignitaries, including the Lord Lieutenant of Tyne and Wear, Susan Winfield OBE and the Mayors of Darlington, Hartlepool and Newcastle. The Mass was followed by a reception at the Assembly Rooms in Newcastle. The following press release was published to mark the occasion. 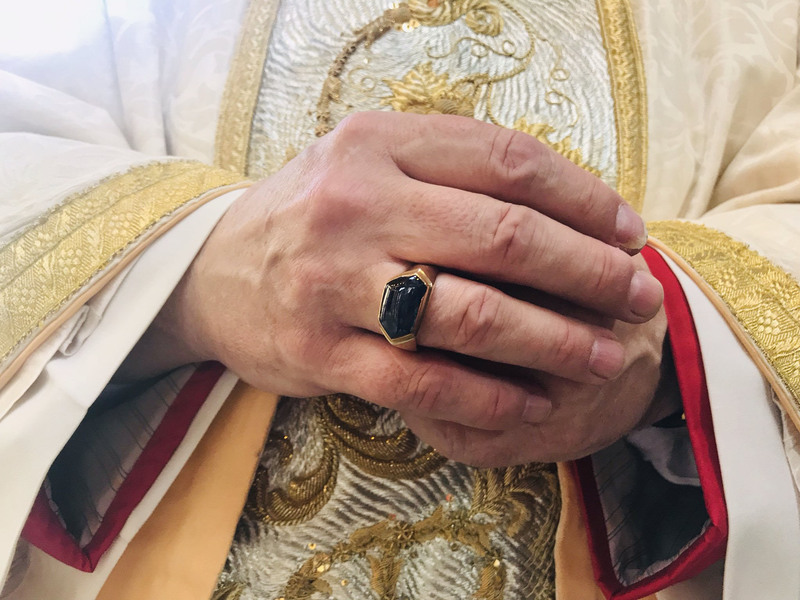 A note on St. Cuthbert's Ring and the Vestments. During his Installation, Bishop Robert wore St. Cuthbert's Ring. Made in the Thirteenth Century, it was recovered from St. Cuthbert's incorrupt body when his tomb in Durham Cathedral was opened at the time of the Reformation. It was hidden and treasured by Catholics in the following centuries. Ushaw College came into possession of the ring in the 1850's. Since that time it has been the tradition that it be worn by the Bishop of Hexham and Newcastle on important occasions at the College. We are very grateful to Ushaw for the loan of St. Cuthbert's Ring for the Installation Mass. The Cope worn by Bishop Robert bears an image of the Annunciation. The embroidery dates to the early 1500's and was entrusted to St. Mary's Cathedral by the Poor Clares, Darlington. The Chasuble worn by Bishop Robert and the Dalmatic and Tunicle worn by his assistant deacons were made in the Eighteenth Century and form part of the gift of the Poor Clares.